This Mars Global Surveyor (MGS) Mars Orbiter Camera (MOC) image shows troughs and a pit chain (on the floor of the deeper trough) located immediately northeast of the giant Tharsis volcano, Arsia Mons. Lava flows have been cut by these troughs, which formed along fault lines when the crust expanded and rock between the fault lines was raised up or dropped down relative to its original position. 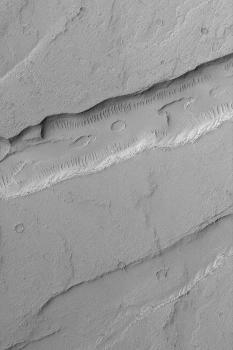 Troughs formed in this way are known as graben. This image is located near 7.1°S, 115.0°W. The scene covers an area approximately 3 km (1.9 mi) across and is illuminated by sunlight from the upper left.